The Checkout Wizard improves your checkout process by making it streamlined and fast. Your shoppers will enjoy faster checkout with far less frustration. Reduces frustration by showing errors as customer types data in checkout fields. Easy data entry with sample background text in fields. Faster, easier checkout with customized numeric keyboards for mobile devices. Fewer steps - customers no longer have to choose type of credit cards � just input the number and the type of card is automatically displayed as text or a highlighted image. Simplifies credit card entry with scan capability for iPhones. Eliminates Chrome's warning message about unsecured forms in checkout. Reporting of checkout errors to Google Analytics. Simple state entry and drop down for APO/FPO addresses. Masking of phones (North America Numbers Only). Fully compatible Yahoo's PCI compliance. International Phone Number Masking and Validation. Visit www.Fastoolnow.com and www.Autographsforsale.com for published examples of the Checkout Wizard in action. Please note - these sites are for reference so you can see how the features listed below work. Your checkout design will remain the same. This services is not a checkout redesign. 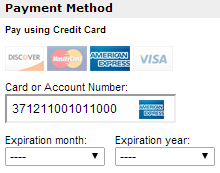 Credit card logos auto-update as shopper enters cc numbers. Add Google Maps address auto-fill functionality for easier ordering. Uses Google Maps technology to auto-populate address fields eliminating frustration and speeding up the ordering process. The annual subscription includes automatic upgrades and ongoing support. Your first year is included! Providing a smooth, frustration-free checkout experience is essential for a webstore's success. The Checkout Wizard eliminates the frustration of filling out an order form only to lose all the data entered because one field was missing data. Checkout Wizard highlights missing data on-the-fly so your busy customers can get right through checkout. Google Maps address autofill eliminates unnecessary typing which is a major aggravation for all shoppers and especially for mobile shoppers. Do your checkout right. Order Now!